Tag Archives for " Google Posts "
Google is at it again! After much anticipation, Google has released Google Posts for all Google My Business users. Originally this feature was only available to select small businesses, celebrities, sports leagues, movies studios, and even political candidates (you may have noticed “candidate cards” throughout 2016 which were essentially the same as Google Posts). Now that this feature is available to all, should you jump on board? Let’s dive into some of the basics and see how it may be useful for your business. Google Posts is a new feature that allows small businesses to create content directly on Google which, in theory, should rank highly in Google’s search engine results pages. The content appears in both Google search and map results. 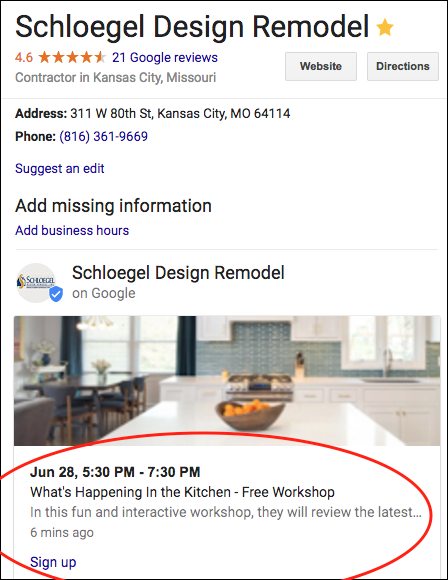 When a person searches for your business by name, your Google Post will appear below the location and contact information of your Google My Business listing. If a user searches for your business with the products or services you provide, as opposed to your name, your Google Post can also be seen within Google’s Local Finder when a user clicks on your business for more details. Posts will remain visible for a week unless you manually remove it before. If you post an event, it will run until the event’s end date. In your Google My Business Account, go to your business listing and click on “Posts” in the left menu. Users can upload an image, write text (up to 300 words), and even post an event with start and end dates, which is one of the primary ways I think this tool should be used. Users can add CTAs to their posts (think Facebook CTAs like “Get Offer, “Learn More” and so on) as well. As of now, Google says it is reporting on the number of times each post has been viewed and how many times it’s been clicked, although, at present, the engagement metric is only visible in the Google My Business App, not in the web dashboard. Additionally, you can use UTM codes to track the links attached to your CTAs. Should you begin using Google Posts? The simple answer is why not? It can’t hurt and Google likes Google stuff, so there’s always that. I recently discussed in an episode of the Duct Tape Marketing Podcast, that fewer people will start to land on a business’s website to get the information they need, and this seems to be another step in that direction. In my opinion, Google Posts is a good idea for small businesses, especially when it comes to announcing events, specials, news, and so on. Who knows how long Google Posts will be around and if they’re here to stay. All I know is that if it is Google-driven, it’s worth diving into and investing some time in (which, if we’re being honest, is why many people are still using Google+). Time will tell how this will play out from an SEO standpoint, but these posts can link back to users’ websites and can drive email signups, which are never bad ideas. And while posts are not currently being indexed and discoverable via regular search inquiries, aside from your business listing, who’s to say that will always be the case? Lastly, while you can have up to ten posts running simultaneously, I’d recommend sticking with one post that represents the most important message you are trying to convey to your audience. I guess it’s always hard to say, but one this is for sure – small business – and particularly Google My Business – is getting some serious attention from Google. In my view, Google is simply trying to get on the customer journey as early as possible. Someone decides to open a business so they need a domain name – Google Domains. My take is Google wants the small business to start at GMB and come back daily rather than set it and forget it. More face time for Google means more ways to sell you stuff!